I did a little research on this article about John H. Nelson's work on how the positions of planets affect magnetic storms on Earth. It looked a little more like astrology than science, but as it turns out, Nelson's findings gained support in both the astronomical and meteorological fields. Naturally, the astrology crowd claimed him as part of their goofiness, but that wasn't Nelson's fault. He published a book in 1974 titled ,"Cosmic Connections." Yeah, even that sound like an astrology title - poor choice (or maybe he was trying to fool the contemporary Pharisees in to buying his book). The book is out of print now, and I could not find any contemporary work that leverages Nelson's work. My guess is that due to the relatively short time that observations were made, the sun had not even gone through a full sunspot cycle. Each sunspot cycle, while occurring on average even eleven years or so, can vary widely both in intensity and duration from one period to the next. What might have produce the claimed 85% accuracy for that particular sunspot cycle likely never provided enough correlation in subsequent cycles to solidify the theory. Several mornings each week, in the center of New York's financial district, the roof of a small structure located atop the RCA Communications building swings open. A hovering helicopter could then see Mr. John H. Nelson, a serious-looking man with thinning hair, assume his place behind a six-inch refracting telescope. Mr. Nelson, an expert in electronics and astronomy, has one of the most specialized and unusual jobs in the world; he is a propagation analyst. What, exactly, does a propagation analyst do? Well, Mr. Nelson forecasts the radio weather, or, in more scientific terms, he predicts the magnetic condition of the ionosphere, a major factor in the propagation of radio waves over long distances. To demonstrate the practical value of knowing what the radio weather will be, let's take a typical example. Transatlantic Message. Suppose we want to send a message from New York to London. 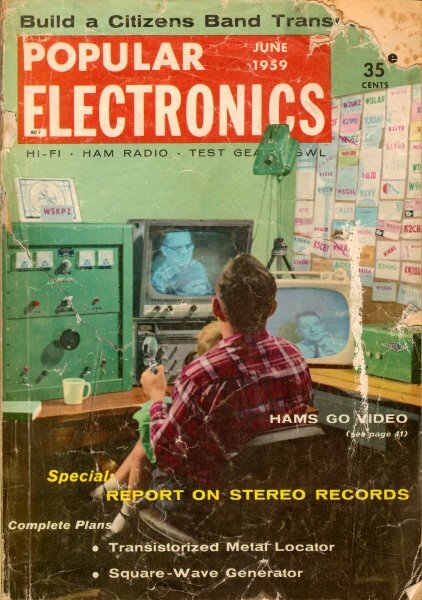 Normally, this message would be transmitted from the RCA station at Rocky Point, N. Y., directly to London. But today, let's say, Mr. Nelson has predicted that conditions will be bad over the direct New York - London route. 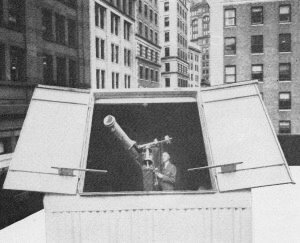 Propagation analyst John H. Nelson is shown at his observatory in the heart of New York City's financial district. Fig. 1 - Radio waves are reflected back to Earth by the action of the ionosphere, thus making possible long-distance radio communications. Fig. 2 - When Saturn, Jupiter, and the Earth are at 90° to each other, magnetic storms appear on Earth and radio reception is poor. Drawing at top is artist's conception of this relationship. So, after consulting one of Mr. Nelson's charts, we decide to reroute the message over an alternate path which is free of ionospheric disturbances. Instead of taking the direct route, we send the message through traffic relay points at Paramaribo on the northern coast of South America, or at Tangier in North Africa. From these points the message is relayed to its destination in London. This rerouting takes advantage of normally ideal north and south transmitting conditions. Thus, rather than being chopped up and garbled because of unfavorable ionospheric conditions, thanks to Mr. Nelson's advance warning, our message gets to London clearly, accurately, and on time. Radio Propagation. 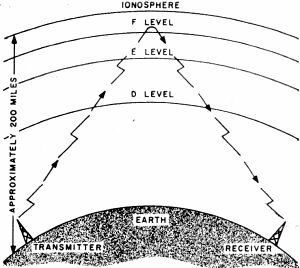 To appreciate the importance of knowing the condition of the ionosphere in predicting radio weather, it is necessary to understand how a radio wave is propagated through space and what part the ionosphere plays in this process. The ionosphere extends from about 40 to 200 miles above the Earth and is composed of a fantastic number of "free" electrons which have been knocked loose from their atoms by ultraviolet rays, cosmic rays, and solar radiation. This gigantic electron sea floats high in our atmosphere, and, like its watery counterparts on Earth, it has tides, storms, and currents. If conditions within the ionosphere are right, when a radio wave from a transmitter strikes it, the wave will be bounced back in much the same manner that light rays are reflected by a mirror. Thus, the radio wave can be returned to the Earth at a considerable distance from its point of origin (see Fig. 1). Long-distance radio communication would be impossible without this reflecting action of the ionosphere. The next question is: how does a propagation analyst know when the ionosphere is going to reflect the radio wave properly? Charting the Planets. 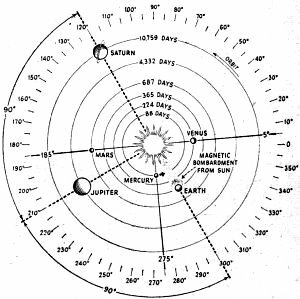 Amazing as it may seem, Mr. Nelson predicts the condition of the ionosphere, and thus, the radio weather, by charting the positions of the planets. 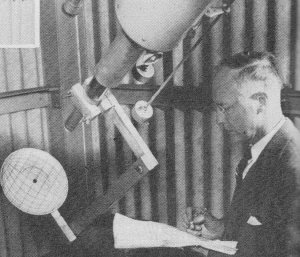 He first began to study radio wave propagation in 1946, at which time he was able to achieve 80% accuracy on 24-hour forecasts by basing predictions on sunspot observation. 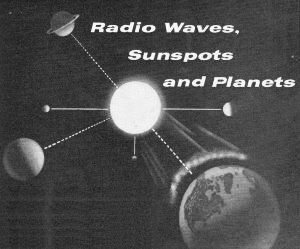 In spite of the apparent success of the sunspot prediction method, however, he felt that the condition of the ionosphere was determined not only by sunspots, but also by the relative positions of the planets as they circle around the sun. Later investigation proved this theory to be correct. As a result of studying planetary positions in addition to sunspot activity, Mr. Nelson's forecasts are now 90% accurate for 30-hour periods. His long-range forecasts, covering periods of 36 days, are 80% accurate. Pluto's angular relationship with the other planets is exceptionally significant in its effect on the radio weather, according to Mr. Nelson. During the International Geophysical Year, which began on July 1, 1957, and ran through December 31, 1958, there were, six very severe magnetic storms and radio disturbances. Analyzing his data, Mr. Nelson found that the positioning of Pluto at a critical zero angle - three times with Venus and once with Mercury - showed up on four of the six disturbances. Since Pluto's mean distance from the sun is 3,671,000,000 miles, its influence would seem to be far-reaching indeed. (1) Best radio reception periods occur when Saturn and Jupiter are 120° apart . (2) The most severe disturbances occur when Mars, Venus, Mercury and the Earth are in critical relationship near points of the Saturn-Jupiter configuration. (4) When the planets have moved away from their critical relationship, there is a corresponding decline in the severity of the magnetic weather. (5) Three planets equally spaced at 15°, 30°,60°, or 120° have a tendency to produce disturbed radio signals if two of the planets are fast-moving and one is a slow-moving planet, or if all three are fast-moving planets. (6) Three planets equally spaced at 60° and four planets equally spaced at 60° will disturb radio signals if at least two or more of the planets are fast-moving. If three or more of the planets in this arrangement are slow planets, no disturbance will occur. Successful Predictions. Mr. Nelson does not attempt to explain why these things happen as they do. What he has learned from his study is that they do happen. Proof? His predictions are successful! In making a forecast, Mr. Nelson starts by calculating the positions of the planets with respect to each other. When a significant combination of angles is indicated, he then calculates the positions to plus or minus 6 minutes of arc for each hour of the day. It is this data which allows him to make the forecast. The implications of John Nelson's work with the planets and radio waves leaves one with the impression that planetary positions might be important in other phases of our lives. Perhaps the ancients' superstitious study of the heavens deserves reevaluation by those of us interested in modern science.